I've always loved screen printed type posters but my husband is not too keen on the likes of "keep calm and carry on" or "for like ever". So while searching for some new blog topic ideas I came across British company Bold & Noble. 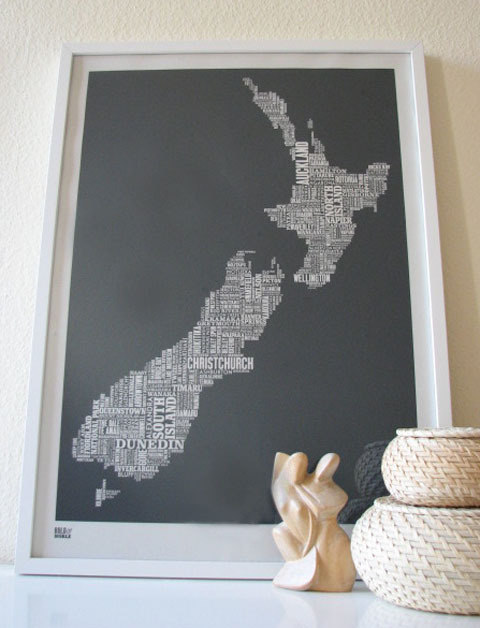 Their New Zealand type map was the perfect gift for my husband who's really missing his home country after two years here in Germany. I ordered the dark gray version and am really pleased with it. The quality is fantastic. The picture below doesn't really do it justice - I just propped it up on our bedroom dresser until it is hung in the lounge above the TV cabinet. I used a 50x70cm IKEA RIBBA frame. Below is a close-up of the print: all the city/town names make up the map - love it! You must check out their other prints as well, particularly if you are an expat feeling a little homesick at times. They also have a nice range of posters for kids rooms. Nina, this is a lovely find. I am sure your hubby will love it. I love it too. I will definitely check on it. It is right timing as I am looking for maps (vintage, picturesque, etc), but then this map is simple yet attractive, suitable for my new living room :) thanks babe..
Oh, these are great, I also really like the Love and the ginkgo leaves print (I have that tree in my backyard). Thanks for the tip! I bought the London map and it looks amazing on my dining room wall!